IT certification is the best way to advance your career. More than half of managers say that their staff is more effective after IT certification. And a happy boss is definitely a good thing. But on a more personal note, over 30 percent of people report more job security with an IT certification, and 60 percent say they love working in IT. 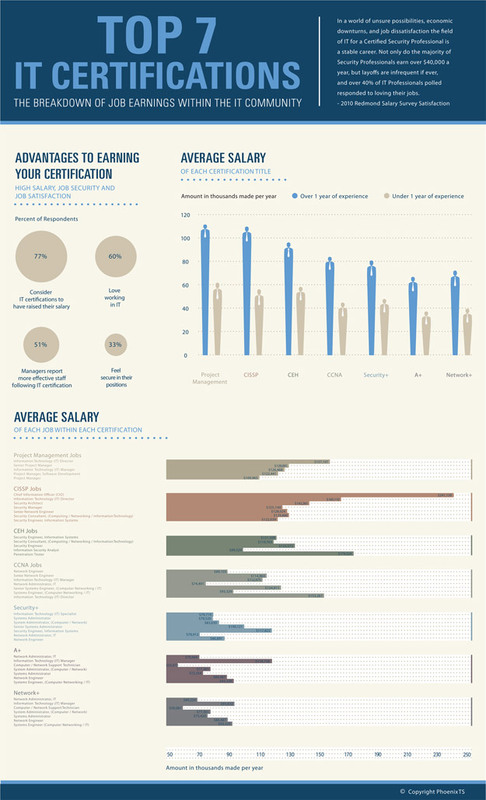 On top of job security and job satisfaction, 77 percent say that IT certifications have raised their salary. Many jobs in IT have average salaries over $100,000 per year. For example, A CCNA certification would qualify you for an IT Director position where you could earn over $150,000 per year. Becoming a Certified Ethical Hacker (CEH) could land you a job as a Licensed Penetration Tester (LPT) making over $170,000 per year. Other job titles include Systems Administrator, Project Manager, Information Security Analyst, Network Engineer, and Security Architect. Getting certified in any one of the top seven areas of IT certification is sure to boost your confidence and further your career. Consider becoming part of the IT community by getting certified in Project Management, CISSP, CEH, CCNA, Security+, A+ or Network+. And check out this infographic to see how other job titles compare.